The Boston Symphony Orchestra under Music Director Andris Nelsons is on its way to becoming a major new provider of opera in the concert format that can reach large parts of the music public who rarely see fully staged opera house productions. Enlarging the BSO universe in this manner will not be uncontroversial. Part of the traditional symphony orchestra audience still associates opera more with common entertainment than with classical aspirations. But for those of us with the opera gene, the development is exciting, because the BSO is capable of probing depths of operatic musical foundation impenetrable to even the finest pit orchestras. 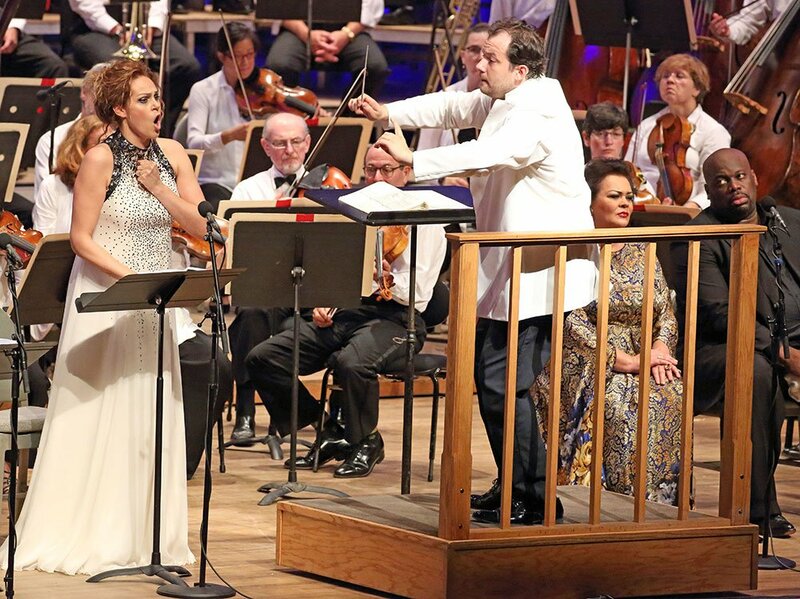 Under the sure hand of Nelsons, the BSO demonstrated some of its potential in this area with the first two acts of Aida in the Tanglewood Shed on Saturday, partnering with the Tanglewood Festival Chorus (prepared for this production by guest director James Burton) and seven world-class singers. Verdi burdened opera companies attempting Aida with one of the most abrupt opening-scene-setting tasks to be found anywhere in a form famous for them. Following brief and worried announcement by an Egyptian high priest of a border incursion from Nubia, Radamés—the tenor protagonist—turns to the audience for the deceptively simple aria “Celeste Aida,” in which he must use his voice to convince us that he is both a warrior experienced enough to lead an army into combat with spears and swords, and deeply in love with a beautiful Nubian slave in the retinue of his King’s daughter. I am sorry to report that this production’s Radamés, Andrea Caré, a highly reputed young Italian tenor, did not do either of those things well. Whether from nerves at his BSO debut, some transient disability that caused him to fall short of the standard implied by his program credits, or simply vagaries of fate oblivious to the well-being of ambitious singers, he was musically insecure. He threw himself at the higher notes, missed low, and had to scramble inelegantly up to where he should have gone in the first place, in plain view of us all. Pole-vaulting up to notes that way is a common hazard of ambitious singing which even great vocal artists cannot always avoid, but it is incompatible with success at the task Verdi gives Radamés. On their best nights, great tenors make us hear the clang of sword striking shield in the first part of the aria, then open their hearts to us with a love-besotted high B-flat in dreamy pianissimo at the end. Caré is sure to have many better nights than this one. Verdi gave an even harder dramatic task to Amneris, the King’s daughter, who also is in love with Radamés and consequently suspicious of his attention to Aida. To evoke the emotions of the opera’s main heavy, the mezzo playing Amneris has to overcome the audience’s dislike of the character if she is to realize the full force of her key role at the opera’s tragic end (not part of this production). None of this was any problem for large-voiced Lithuanian singer Violeta Urmana, who also was making her BSO and Tanglewood debut. In the small role of the high priest Ramfis, Korean bass Kwangchul Youn deployed a rich, authoritative, supple sound that would arrest audience attention in nearly any role in the bass repertory. He would have been as at home in the roles of the Egyptian king or Nubian warrior King Amonasro as the artists who played them in this production. I even found myself wondering what his remarkable voice quality and expressive latitude evident in so small a part might bring to Boris Godunov. Italian tenor Alfredo Nigro and baritone Franco Vassallo gave the audience the battlefront Messenger and captive Nubian King Amonasro with comfortable professionalism. Special mention is due soprano Bethany Worrell, a TFC member whose ethereal tone as the High Priestess enriched the texture of the production beyond the few measures of music in which we heard it. With her early exploration of the part in this production, Kristine Opolais as Aida may well have opened a new chapter in her own already remarkable career, and possibly also in the opera’s production history. She can make her voice girlish, as she did during the first part of her appearance in act I, before modulating into the anguish Verdi wrote for the character as she realizes she has been caught up in the frenzied preparation for war against her own. In the Finale at the end of act II, she let forth a full, rich, decidedly non-girlish sound that soared over the massed fortissimo of orchestra and chorus exactly as Verdi must have intended. Not yet 40, she is already working with a skillset at the top of what is expected, and if she refines it further she may change the definition of what the top is. Voices like hers often enlarge and darken as their owner moves into mid-career. Imagine. There is no telling where this voice may go. Morris Robinson is already among the greatest low male voices of the recorded era. He appeared startled when I put that proposition to him in an aisle of the Shed after a morning open rehearsal, but also graceful in receiving the idea without pro forma false modesty. Predecessors in that category whom he especially admires, he said, include Ambrogio Maestri and Jerome Hines. I asked him about Kurt Moll, whose Sarastro in Mozart’s Magic Flute 40 years ago in Paris was the most authoritative I had heard before Robinson’s own remarkable version at the Houston Grand Opera last year. He paused, straightened up to his full height of well over six feet, and said, “I’ve learned a lot from Kurt Moll”. Robinson is only 47, and despite “starting late” agreed that he has a good 20 more years to refine the roles he already knows and explore new ones. Like Opolais, he clearly has potential to change how the world sees opera in the 21st century. With this production, Nelsons, the BSO, and TFC demonstrated that a measurable part of that change may well take place before New England audiences. James Prichard is a Yale physician and scientist who occasionally pinch-hits as a music critic.